Home / Calming The Mind Within / Isolation Or Unity? We have all felt a terribly sense of isolation or loneliness at some point in our lives, but what brings about loneliness? Why do we feel a sense of isolation? Isolation and unity are opposites on a spectrum. We don’t just wake up one morning and feel an overwhelming sense of isolation and loneliness, we get there through a process. The same can be said of feeling connected, unified and loved. Isolation is a natural consequence of becoming more egotistical just as unity is a product of becoming more spiritual. While it is true that some are born into poverty and perhaps abandoned by their parents, most of us have the advantage of living in the most prosperous nation on earth. Here in the United States we are free to pursue our dreams by working hard and taking responsibility for our lives. Whether we choose to live a life of love and unity or create an environment of isolation, is also a matter of personal choice and responsibility. Love and unity is our natural state, it is the state of the spiritual and it is the natural evolution of our soul. We choose isolation by our attachments and desires. In our culture we are conditioned to pursue the attitudes and mental states that can lead to isolation. We are conditioned to attain success, to amass worldly goods, to attain positions of power or fame. We glorify people and make celebrities of those who have achieved these milestones. 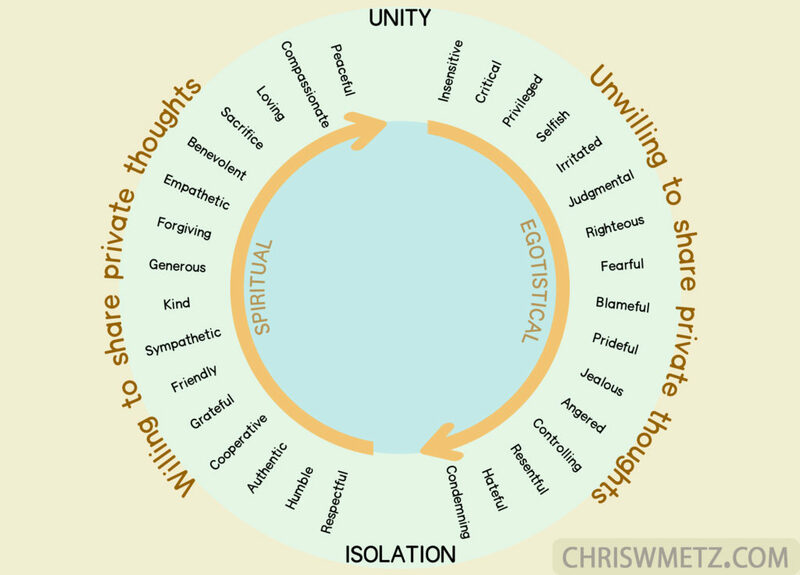 Referring to the circular diagram in this post, we go from unity to isolation through a process of unconscious mental conditioning or series of unconscious reactive choices. I say unconscious because no one pursues the goal of loneliness or isolation. Starting at unity and moving to isolation occurs through a sequence of egoic attitudes or a sequence of egoic thoughts. They follow in a fairly logical sequence, though they may not always happen in an exact order. Let’s also clarify and define unity as a sense of love and oneness with everything. Insensitive – When the welfare of others is not our overriding principle in life then it could be said we are insensitive to the needs of any part of the whole. We become insensitive to the suffering or needs of others. Critical – As we move from being insensitive to critical we start to formulate opinions and differences between people and things. We start to divide the wholeness by defining and assigning differences between things. Privileged – Somewhere along the line we start to feel as if our opinion matters. We feel we are fortunate or ordained to discern good against bad. Selfish – We start to develop the notion we deserve to have our material wants and desires fulfilled. As with any material item the more we share the less we have for ourselves, thus begins the idea of keeping material items to ourselves, as giving means less for ourselves. Irritated – We now notice others have more than we do or seem to live happier lives and this starts to irritate us. Judgmental – We begin to judge everything as good or bad as it pertains to our selfish point of view or our ideas about life. Everyone and everything starts to go through our filter of good or bad, right or wrong as we perceive it and define it. We can stop the slide into isolation if we can keep ourselves from judging others. Righteous – We become an expert at judging and start justifying our judgments believing somehow we are right and everyone else is wrong. Fearful – We become so attached to our possessions, opinions and judgments that we are now afraid of our opinions being attacked. We also become fearful of losing our possessions. Blameful – When we are unable to have all our desires fulfilled or lose something we are attached to, we start to blame everything outside ourselves. We develop a lofty list of desires that are not met and an equal list of people and situations that are to blame. Prideful – We become so worried about what other people think of us but we remain convinced of being right. This develops within us a false sense of self-worth. Here we need to prove other people wrong and we need to display our sense of self-worth through material objects, boasting, gloating over a win, showing off and glorifying our life and experiences in hopes of impressing others, ironically it further isolates us from others. Angered – Moving through and accumulating blame, pride and jealousy, we now become angry we do not have everything we want and that anger gets directed to the world outside of us. The more our anger gets vented, the less people wish to be around us. Controlling – In our final attempts of getting what we desire we start controlling others as a means of getting what we want. We may get some short term desires fulfilled but ultimately we drive away the last remaining people who were close to us. Resentful – When we are unable to control others or control the events in our life we become resentful. This resentment cannot be hidden and we become a negative force pushing away anything positive in our life. Hateful – Resentment turns to hate, destroying anything positive in our life. Our hatred starts to eat away at every aspect of our life. We cannot hate someone or something without it affecting everything else in our life. Condemning – It is not enough to hate someone, now we wish destruction, we want to destroy and discredit others and we wish physical harm to others. This final stage of isolation is one in which our private thoughts are so negative and mean spirited that we must keep most of our thoughts to ourselves. Ironically no one can hide their overriding thoughts and feelings. People at this level of egotistical isolation are difficult to be around. They literally drain the energy from other people and as a result they are avoided like the plague. Most relationships at this level are short lived and superficial by nature. Ironically at this level people often find companionship with others of a similar nature. This occurs by unconsciously allowing the ego control of our life. We isolate ourselves through our thoughts, behaviors and actions in life. We don’t find ourselves in isolation by accident, we get there through our own selfish and unconscious actions. As we impose more of our opinions on the world and play God in determining the right and wrong or good and bad of everything, we alienate ourselves from the wholeness of the world. In our quest to get our way and have our unique individual desires met, we find it can only be done in complete isolation. The next time you are feeling lonely and isolated from others review this diagram and reflect on the sequence of thoughts, actions and behaviors that got you there. Think about all of the friendships you had at one time or another that ended in hatred, anger or indifference. Is this list larger than your current friendships? Do you have deep rooted long term relationships that have withstood the test of time, or are your current friendships short-term acquaintances known only on a superficial level? If you have any enemies, can you see how they progressed by way of the steps into isolation. This entry was posted in Calming The Mind Within, Ego, Self Awareness, Spirituality. Bookmark the permalink. As always, the truth in ways I’d never be able to verbalise myself. A thing that I’ve noticed years ago, and I tell all my friends who are eager to listen, is how we end up devoting so much time and energy trying to get the care and the attention of people who are not supposed to naturally gravitate around us and vice versa. At work, they keep spending money bringing a pub to the office, to see if we integrate better, when actually people make friends even with colleagues they have no work in common because people will just find their matches naturally. Some of my friends seem to devote so much time and energy to people who tolerate them, instead of spending with people who celebrate their presence. And the last group is always there, no matter what. My best friends are my childhood friends, and what a blessing that is! I’m frequently in touch with most of them, but even when that’s not the case, when we meet it feels like we were apart for a couple of hours only. And even as time goes, I still make at least one real friend per year, just by keeping an open heart. I hope your other readers will understand that with an open heart and pure intention, people who are supposed to gravitate around us will. The ones that understand us even in absolute silence.